It may be true that Windows has a built-in clipboard that can temporarily store your copied content. However, it can only store one item at a time. This can be quite frustrating especially if you’re constantly working on tasks that require you to copy and paste multiple items (ex. data entry, data processing, etc.). Fortunately, there’s CopyQ – an advanced clipboard manager that keeps a record of your previously copied items. 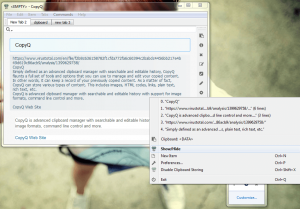 Simply defined as an advanced clipboard manager with searchable and editable history, CopyQ flaunts a full set of tools and options that you can use to manage and edit your copied content. In other words, it can keep a record of your previously copied items. As a matter of fact, CopyQ can store various types of content. This includes images, HTML codes, links, plain text, rich text, etc. Customizable appearance – supports multiple themes such as dark, forest, paper, simple, solarized-light, solarized-dark, etc. 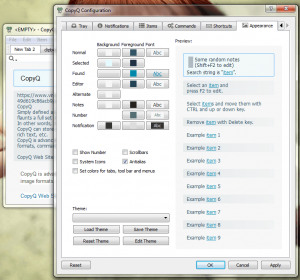 Unlike other clipboard managers, CopyQ flaunts an advanced user interface so it may take some time before you can get fully accustomed to its controls. Once installed, CopyQ will remain hidden in your system tray area so it won’t interfere with your other activities. Just keep in mind that CopyQ is mainly designed to keep a record of all your copied items so it makes it easier for you to retrieve all sorts of information that you’ve copied to your clipboard. To access your saved items, simply click the program’s icon in your system tray area. Notice that your saved items are sorted by tabs. It should also be noted that this clipboard manager can store items in different formats. Not only does it have the capability to store text, it can also store HTML codes, links and images. To search for a particular item, just type the keyword or phrase in its search box. You can also opt to sort out your saved items in ascending (A-Z) or descending order (Z-A). Furthermore, the latest items that you’ve copied will be automatically saved in the first tab. To add a new tab, just type Ctrl+ T and then enter the name that you want for your tab. If you want to copy and paste an item, highlight it by clicking its respective section. Once you’re done, just click the “Move to Clipboard” button that is located on the toolbox (the one that is located on the right side of your active tab). Once you’ve move your selected item to clipboard, you can paste it wherever you want. Just remember that you can only save one item to clipboard. If you want to paste multiple items, you’d have to select them all at once and then click the “Edit” and “Save” button. This way, you can fuse multiple items so that they can be copied to your clipboard. Of course, this is just one of the many things that CopyQ can do as it can also let you copy any item in its original HTML or plain text format. 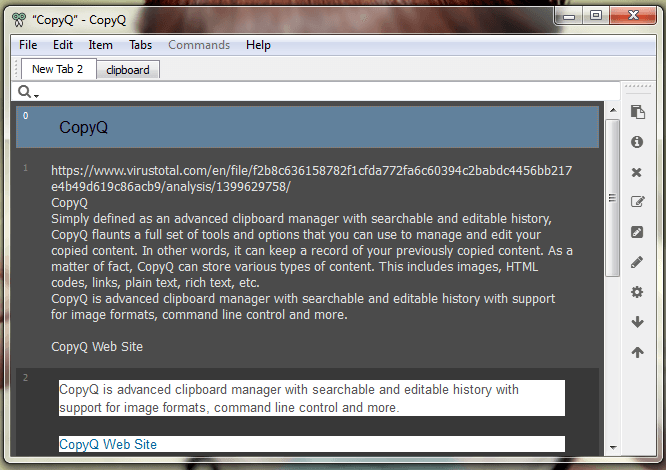 Functionality wise, I have to say that CopyQ is a very reliable clipboard manager. It doesn’t lag, it is very stable and responsive plus it is way more convenient than having to redo your copy and paste tasks over and over again. I just noticed that it cannot properly paste text with links. So if ever you wish to copy and paste a text with link, only the text will be preserved and not the link. Anyhow, I find CopyQ very suitable for users of all levels so it doesn’t matter if you don’t have much knowledge with computers. Needless to say, this clipboard manager suits everyone. It is a must-have tool for both students and professionals. 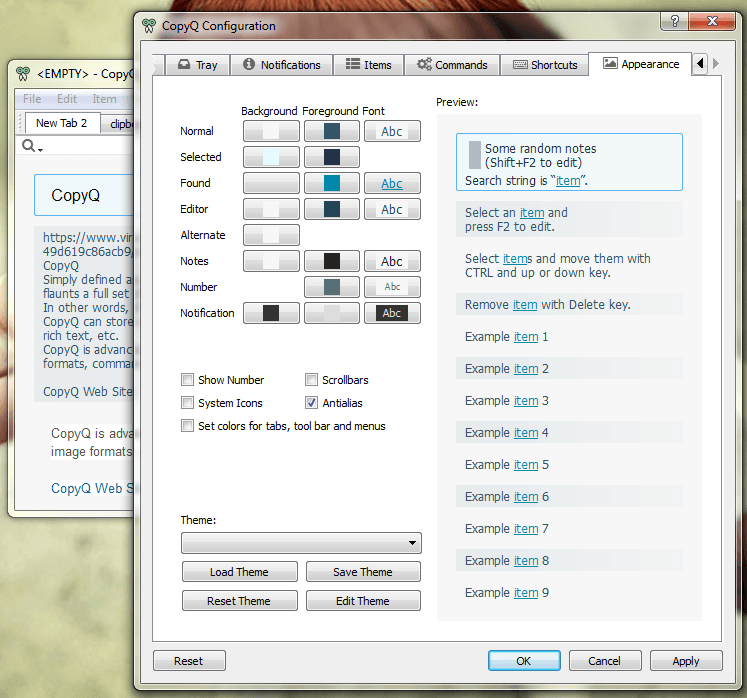 CopyQ has definitely proven its worth as it basically adds more functionality to your Windows clipboard tool. It also very convenient to use plus it suits all types of users. With its tools and features alone, you’d be more than happy to use it whenever you like. So go ahead and give it a try.